This timeless Classic Gold Tungsten Carbide ring is sure to turn heads! 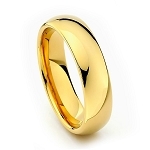 This Gold Classic Tungsten ring also comes in a 4mm and 5mm band. Q: Is this gold ring have a 14 carot gold plating on the outside? What is the gold color from? Was this answer helpful? 65 of 69 Customer(s) found this Answer helpful. Q: Is this genuine Tungsten Carbide metal? Was this answer helpful? 40 of 44 Customer(s) found this Answer helpful. 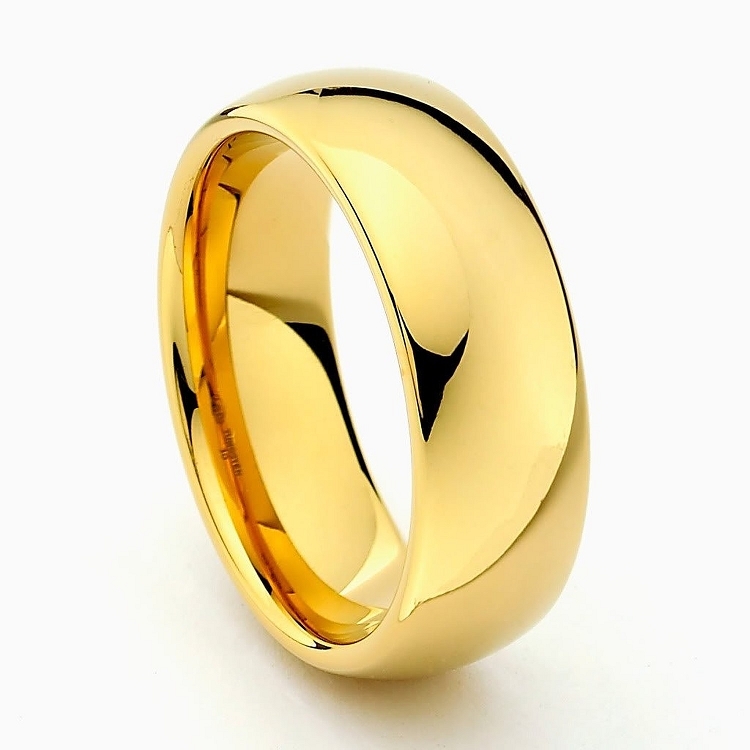 Q: As this ring is gold plated, how do you keep the gold and gold coloring from wearing off? 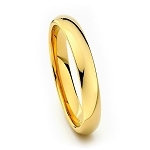 A: This ring is gold plated and we have a lifetime warranty that ring will not chip, fade or scratch. Thank You! Was this answer helpful? 40 of 46 Customer(s) found this Answer helpful. Q: does this ring have a black streak on it? A: No. The entire ring is solid gold. What you see on the photo is a reflection. Hope this helps! Was this answer helpful? 34 of 39 Customer(s) found this Answer helpful. A: You can take one of her rings and bring it to a local store to find out the size. You can also take a measurement of her ring and use our online ring size chart to find out the size that way. With the engraving, we engrave on the inside of the rings. If you need anything else, please let us know! Thank you, TF! Was this answer helpful? 30 of 33 Customer(s) found this Answer helpful. Q: What carat of gold/ Is it plated or actual gold and tungsten? A: 14K and is gold plated. Thank you! Q: Is this solid gold or plated and if so can I have more details ? 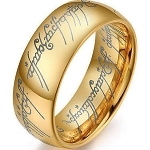 A: This ring is gold plated. Thank you! Q: Does the color of the ring change? Is the ring gold plated, How long is the guarantee? Q: What if the size doen't fit? I think my size is 7, but what I'm wrong? Can I return the item? Thank you. Q: is the engraving done in the inside? A: Hi Bernie, We engrave on the inside of the ring. Hope this helps! Thank you, TF! Q: Will this ring turn Green? A: Never. Our rings are Hypoallergenic, Cobalt Free and will never turn your finger green! Q: Is this ring plated or is the gold color all the way through? Q: What is the price for a matching men's and women's Tungsten Carbide Ring? Do they have to be ordered separately? Q: Is this a comfort fit band? I am very happy with my gold ring. I had a little trouble choosing the right size. It took me two times to get it right but the people at Tungsten Fashions were very helpful and made the process very easy. I am so happy with the ring that I ordered a black one also! You won't be sorry if you get one of their rings. Thank you, Tungsten Fashions for a great online shopping experience. You people are top notch! Best wedding ring I have ever had. Great weight, the fit is perfect and the gold looks just like the real gold 8mm band I have. Just 1250 dollars cheaper. I have always wanted a gold band as a second wedding ring. This band was as beautiful as any solid gold ring I have seen or tried on. The feel of the metal is awesome and as smooth as butter. Will be ordering some thumb rings from here also. I really like the 8mm ring. Nice a bold for a big fellow like me. Purchased one size to big and tried it for a couple of days and was afraid I would lose it on cold days or washing my hands in cold water. Returns were easy. Great company. Will purchase here again. Very pleased with ring. Looks great and feels better. We love the matching gold rings we bought after exchanging a different style. They fit perfectly and look so nice. Great value and quality. Hi am so satisfied with this through. The color and the sign is beyond awesome. I definitely will be buying from this company again! Even when I picked the wrong size and returned the ring for the correct size, you guys where amazing and so helpful! Thank you again! I wore a gold wedding band for 30 years, and it was tie for a new one. I chose the classic gold tungsten for the next 30. Looks great, fits great, beautiful shine compared to the gold one. Love my new wedding band. Thanks tungsten fashions. It is my first. I have gotten so many compliments and people think I paid a large sticker price. I certainly will recommend your company every chance I get. I am very pleased with my purchase and will definitely be making more purchases in the future. Outstanding value and it looks great! The ring arrived quickly and looked just like the picture on the web site. It looks and feels great and I'm very pleased with the fit and finish. A few years ago this ring style was not available gold plated, so I went for it the moment I saw it. It is comfortable, heavy (something I really like about it)and it looks great. It does look like a real gold ring, making it a very good replacement for your expensive gold band which you can set aside for special occasions.